In NUS CS3243 (Introduction to Artificial Intelligence) we had a project, which is to build an agent that plays Tetris. It was an interesting project, even though I sort of freerided (sorry my teammates haha). I forsee that this can be long, hence I decided to break it into a few parts. This part talks about the underlying model, which is Markov Decision Process (MDP). Probably in the next part I will talk about approximation algorithms and LSPI itself, and the final part I will try to re-implement it with a simpler game. The idea of a MDP is simple. We have a set of states , as well as a set of actions . An action brings you from a state to some other states with a given probablity. Doing an action can also give you a reward. 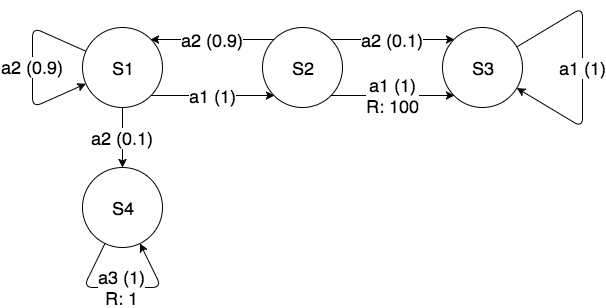 Shown above is an example of a Markov Decision Process. Here, the states are indicated by until , and the actions are , , and . Listed in the brackets are the probability that doing an action will bring you to that state. For example, while action will always bring you from to , action has 0.9 probability of bringing you back to , and 0.1 probability of bringing you to . As you can see, an action can bring you back to the same state. Also listed after the letter R is the reward. For example, the reward of doing action that brings you from to is 100, while the reward of doing action that brings you from to is 1. So, what can be modeled by this, you may ask? Many things! Consider, for example, Tetris; here, the states are the position of the board as well as the next piece, and the action is the act of placing a piece into the board. The rewards would be the number of points you get. Most likely, this would be the number of rows cleared; in certain games, however, you might get rewarded for things like back-to-back Tetris or T-spins. In this case, the probability of any action will always be 1. We can also look at Yahtzee, for example. Here, the states are everything that describes the current position. This includes points filled in the scoresheet, current dice position, turn number, and so on. The actions would be the dice that you choose to roll, or filling in a scoresheet. The reward would be the number of points you get on filling in a score, and the probablity varies according to the action taken. If you’re rolling all 5 dice, for example, there are states that you can reach! What is the main objective of this MDP, anyways? The idea is to find a policy that specifies what action should one take from a given state, so that we can maximize the total number of rewards over time. On the MDP above, for example, a policy would be to do action from , action from , action from , and action from . Before we proceed, it’s a good idea to formalize everything to remove any doubts. , a set of states. , a set of actions. , the probability function. This function takes in the starting state , the action and the resulting state . In the diagram above, while . , the reward function. In the diagram above, , while . , the discount factor, which is described below. is maximized. Here denotes the “time” and are states the agent is in at time respectively. We can see that is a value that diminishes the importance of future rewards. This is typically close to 1, and is only there so that the infinite sum can converge. Indeed, if and are both finite, has a upper bound and the sum will definitely converge if . There should be nothing wrong with setting though! So how do we actually find this optimal policy ? A simple idea might be to just take the action that maximizes the direct reward. For example, in the sample above, we can just take from since we can cash 100 instantly.